U4V•MAG is the web-based magazine of U4V (UNESCOforVICENZA). It aims to value and promote the Palladian style, by proposing means to truthfully respect the UNESCO principles and the motivations that led to the inscription of the site of Vicenza on the World Heritage List. In this section you will find U4V Chronicle, which details the cultural premises and actions that have led to the formation of U4V and its Objectives.Here below we present the U4V•MAG editorial board and its group members. U4V•MAG is non-periodic, in that it is updated as frequently as new contents and documents are made available to share with followers of U4V activities. Engaged in civic movements, primarily in the opposition to the militarization of the city of Vicenza, he is mainly involved in the“Tavolo della partecipazione del parco della pace”(Participation table of the Peace Park) initiated by the Municipality of Vicenza in March 2013. Certified in Gardening and Landscaping Architecture (A&BS Villa Montalto, Florence), she has been a member of AIAPP (Italian Association of Landscape Architects) since 1993. Since always dedicated to landscaping themes, she is a founding member of the association “Amici dei Parchi”(Friends of the Parks, 1999), founding member and president of the association “Civiltà del Verde” (Green Civilization, 2006). She is also founder of OUT – Osservatorio Urbano/Territoriale di Vicenza – Urban Territorial Observatory of Vicenza (2013). Researcher of Theories and techniques of city planning at the Department of Architecture at the University of Ferrara, where she teaches Fundamentals of City and Landscape Planning. Her research activities are focused on aspects of care and management of cultural heritage, participated practices of town planning and community development. 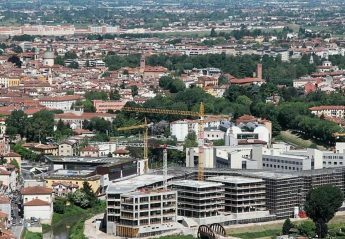 She is among the founders of OUT – Osservatorio Urbano/Territoriale di Vicenza – Urban Territorial Observatory of Vicenza. Cultural director and activist, he is the author of multiple artistic and cultural activities in defence of Vicenza, such as the UNESCO Instance 2007-2010. He is proprietor of the publishing house Antersass (1999), focused on anthropologic themes, civil commitment and cultural geography. Research bookseller, alpinist and explorer, he founded and has been running, for many years, the activities of Casa di Cultura C (House of Culture C).